In November 1938, as Hitler was preaching his gospel of hate, French Prime Minister Léon Blum delivered a speech to the International League Against Anti-Semitism about “the tragic Jewish question.” Urging European nations to open their doors to the growing number of Jewish refugees who had been condemned “to a bitter and unfortunate fate,” he left no doubt about his identity. “I am a Jew who has never boasted of his background but who has never been ashamed of it either, a Jew who has always opened up to his name,” he declared. This was vintage Blum, and explains why he is a perfect subject for Yale’s Jewish Lives series. Pierre Birnbaum, professor emeritus at the Sorbonne, points out that Blum’s electoral victory in France in 1936 as head of the Popular Front, a coalition of leftist parties, was not the first time that a Jew had risen so high in European politics. Benjamin Disraeli served as Britain’s prime minister in the previous century—but he was a convert to the Anglican faith. “For the first time, not only in France but in the modern era, a Jew who did not hide his identity but often proclaimed it with pride had become the head of a major government,” Birnbaum writes. Born into an Alsatian Jewish family in 1872, Blum grew up in the tradition of assimilated, patriotic French Jews. He treated his religion with respect but did not always observe its strictures, dismissing Jewish dietary laws as “superstitions.” While developing into what Birnbaum calls “a full-fledged state Jew” as a civil servant who handled cases brought before the Council of State that administers French law, Blum was no mere functionary. He became a staunch defender of Captain Alfred Dreyfus, a fellow Alsatian Jew accused of treason, denouncing the anti-Semitism that had triggered his imprisonment in the 1890s. Soon Blum would enter the political fray, emerging as the leader of France’s Socialist Party. But what makes Blum so fascinating is that he could not be defined purely by his religion or politics. Birnbaum conveys his subject’s deeply French approach to life. As he puts it in his own distinctly French style, the young Blum “was a student of amorous passion,” a romantic when it came to both literature and love. Before he became a famous politician, he developed a reputation as a man of letters, writing numerous reviews and essays. He particularly admired Stendhal’s young hero, Julien Sorel, in The Red and the Black. Like Sorel, Blum had conflicting love affairs: He was married three times, each time to a Jewish woman. Blum was also passionate about his concepts of social justice, derived from his belief that “the Jew’s religion is justice,” including in sexual relations. To prepare for healthy marriages, he argued, both men and women should “sow their wild oats” first. “A life of adventure should precede married life,” he wrote. Dressed like a dandy, the young Blum was attacked as an “Israelite boy-child” who liked to be “hugged in the Greek manner.” Yet this supposedly effeminate young man did not hesitate to engage in a duel with a theater critic, which he won by wounding him with his sword. He displayed remarkable physical courage throughout his life, standing his ground when attacked by a right-wing mob in February 1936. Blum’s notion of socialism ruled out the use of the kind of force on gory display during the Bolshevik Revolution. Birnbaum points to the prescience of his warnings about the path Russia’s new rulers were taking, using terrorism “as a means of government.” Long before the revelations of Arthur Koestler and Aleksandr Solzhenitsyn, Blum produced “one of the most impressive exposés of the logic of totalitarianism.” French socialism, he insisted, had to uphold democratic values and protect the rights of individuals. Nonetheless, with Europe increasingly split between the radical left and right in the 1930s, Blum accepted the support of the Communist Party for the Popular Front. As prime minister, he transformed labor relations, instituting paid vacations for the first time. But the turmoil of the period continued unabated, and his appeals to offer asylum to foreigners, along with the right to work, produced a furious backlash heavily laced with anti-Semitism. 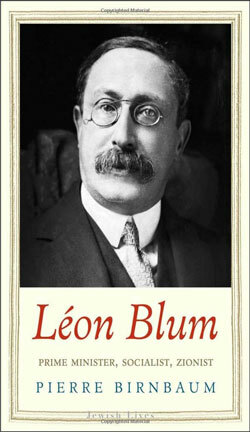 One right-wing writer proclaimed that Léon Blum filled him “with a far deeper repugnance” than Hitler did. “My duty is calmly to defy the injustice and hatred that have been let loose in the land,” he declared. Unlike many of his Socialist colleagues who backed the Vichy regime, Blum pledged to support Charles de Gaulle, the leader of Free France, and confidently predicted Germany’s defeat. The Vichy authorities arrested him, charging that he had “betrayed the duties of his office” when he was prime minister, weakening France to the point where it could not defend itself. At his trial in 1942, he mounted such an effective defense that he demolished his accusers’ legitimacy, triggering a new round of anti-Semitic attacks. Blum’s performance won international accolades, prompting the puppet Vichy regime to halt the trial. He was soon deported to Germany, ending up in Buchenwald. But his undeniable stature earned him special treatment: Along with his current lover, he lived in a heavily guarded hunting lodge outside the concentration camp. After the war, he rejected “the condemnation of Germans on racial grounds as I reject it for the Jews.” He served very briefly as prime minister again, and in his final period urged support for the new State of Israel. In 1950, he died of a heart attack. As Birnbaum observes, Blum was tainted by the overall failures of the interwar Third Republic, and his postwar attempt at offering a “third way” between Communism and Gaullism quickly failed, too. But he steadfastly supported a free, democratic France based on the principles—not the practice—of the French Revolution. Despite the predictable attacks on him as a member of an “accursed,” allegedly foreign, race, he was always a proud native son. A former foreign correspondent for Newsweek magazine, Andrew Nagorski is the author of Hitlerland: American Eyewitnesses to the Nazi Rise to Power. His new book, The Nazi Hunters, will be published next year.